Are you headed to the integratEd / #iPDX14 conference in Portland OR? Wondering what sessions to attend? Here’s a preview to one of my sessions: “Right From the Start: Case Study in Infusing Tech and PBL in the Classroom.” (Feb 27 – 1:30-2:30). What’s a conference session on PBL / tech for pre-service teachers have to offer the experienced teacher? Spoiler alert – it’s not all positive. My students had a great PBL experience and produced showcase products, but did that sacrifice time we could have devoted to other content and skills? This past fall I taught a grad / undergrad level education course in social studies methods at the University of Portland. Here’s our course blog with lessons and student work. Instead of simply telling my preservice teachers about the critical components of the new classroom – student-centered, project-driven, community-based, tech-integrated – we used them. 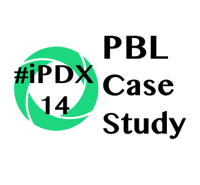 This iPDX14 session will give participants a look at these instructional approaches, work-flow models, sample projects and a reflection on how it went. While the case study will feature the higher ed classroom, the lessons learned should also be of value to intermediate through secondary teachers. Here’s more of my posts tagged PBL. I’ll be joined by two of my students – Christina Steiner (BS Secondary Ed / BA History 2014) and Samuel TS Kelley (MAT 2014). You’ll hear their reactions to the PBL approach and how it impacted their thinking about teaching strategies. They also share some feedback from their cohorts. Spoiler alert – it’s not all positive. My students had a great PBL experience and produced showcase products, but did that sacrifice time we could have devoted to other content and skills? Christina and Samuel will give you their take on that trade off. You’ll see the products of our partnership with a Japanese American History Museum in a variety of projects – designing curriculum for traveling exhibits, curating an online video archive, and developing an iOS app walking tour of Japantown PDX. Student also collaborated on publishing an iBook – Exploring History – a showcase of model document-based questions. I regularly meet with my colleague and friend Mike Gwaltney at Bailey’s Tap Room to share a brew and conversation. Here’s a recent chat we had about my methods’ class – goals, challenges and results. It’s a good intro to this iPDX session. Note: most things in Portland are done with beer.